Every day, entrepreneurs all over America plan their day with Great Expectations. They inhale breakfast, fly through morning traffic, and hit the office floor running. If you are a typical entrepreneur, you have more than one mountain on your agenda to move. But shortly after the day begins, something happens. The plan begins to melt before your very eyes. Pressing questions appear from customers and employees. Computer issues raise their ugly heads. Emails galore. And your phone sounds like one of those old-fashioned customer service bells. Ring for service. Ding ding ding. Are you not paying attention? Look at me. Ding ding distraction. Welcome to the 21st Century. Digital technology may have made our lives better, but it certainly has not made it easier. You now have 1,000,001 apps that can assist you in moving those mountains. Pick me! Pick me! But along with that help, you get popup windows, flashing videos, and hey, there’s an interesting read! Squirrel! Somehow it feels like you are back on the high school dance floor. The strobe light is pulsing to a bass line that could knock your teeth out, and your brains feel numb. The plan falls to the floor, and we did not even notice when it slipped from our hands. Hence, we have uncovered the second largest rock to growth: the demon of distraction. (Last week, we talked about the biggest obstacle. Read all about it here.) Distraction will stunt your growth. If you run a successful business, and you keep your promises, you will get busier and busier by the day. Distractions quickly follow, and come in many shapes and sizes. Most dedicated entrepreneurs take all the interruptions on, doing something with each limb. They see busyness as the price of success. They conclude there are not enough hours in a day to fill orders and plan too, and the planning goes out the window. And with the planning, future growth. Even ideas can be a bright shiny distraction. True entrepreneurs will always have more ideas than time. Each one can hold so much potential! But the price of this distraction is a lack of focus. Lack of focus is deadly. Finally, there are the all the necessary tasks of business. As the business grows, it is difficult to get your necessary ducks in a row. What to do? How to divide and conquer? The first step to victory over the demon of distraction is to identify the enemy. Know how the enemy works. Guard your planning time with your life. Thinking is the most valuable activity in your business. If you are not making time to plan, you are reacting instead of leading. Review your plan each day first, before reading your email. Do not allow yourself to become a reactor, or you will allow others to dictate how you will spend your day. Guard your vision and mission with your life. There are many ways to make money. Entrepreneurs can get distracted by too many ideas. But even though an idea may have great potential, it may not fit the future shape of the company. Like a child’s shape toy, toss any bright shiny object that does not fit the shape of your vision. Guard your time with your life. Write down every necessary task in your business. Map them out on your weekly calendar. Just like a financial budget, you will always find you have more obligations than assets. Time is far more valuable than money. Budget your time. Place book ends on the amount of time you will allow for each task. Do not allow any one task to drag on and on. If you know you have a tendency to get sucked into social media, set an alarm for the time allowed. When the alarm rings, shut it down. Schedule according to your body clock. If you think with more clarity in the morning, schedule your important tasks before your brain power wanes. Bookends work well if you are the kind of person that works best under deadlines. Guard your priorities with your life. You can only land one plane at a time, and only you can determine their order of importance. Focus on the top three planes, and choose one. Choosing is hard, but you must choose. At one point in our business, I felt every task I had on my list was equally urgent and important. I once complained to a peer that I could not get my ducks in a row. I felt they were all running around in circles. He responded, “That is when you just start picking them off, one at a time.” Great advice. Guard your brain with your life. Take a digital Sabbath and a vow of digital silence. Plan a holiday from social media, from screens, and from computers altogether. Find time to get outside, to clear your head and heart, and strengthen your body. You will return to the real world with fresh creativity. Leisure is not optional in the entrepreneur’s time budget. You are the adult in the room. You can eliminate distraction. Focus is a choice. If you do not take the time to plan, you are planning to waste your time. If you are not taking the time to eliminate distractions and focus your efforts, your business is getting watered down little by little, day by day. When we choose to focus all our energy and cognition on one thing, we are like sunbeams through a magnifying glass. We can burn our way through any task in far less time. Don’t let your busyness rob you of your business. Carpe Diem. One thing I love about small business is that every single one holds the promise of metamorphosis. Most of them end up becoming something they did not start out to be. It is a law of nature. If you plant a seed in the ground and expose it to the right conditions, wah-lah, it grows. It cannot help itself. It is alive, and living things grow. In a few short weeks, it will be transformed into something completely different than it started out to be, leaving the tiny seed casing behind. It is the same for small business. The transformation is a beautiful thing, and growing is an art. Last week, we talked about how small business is a lot like farming. 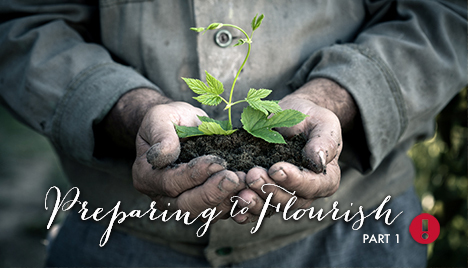 You have to plan, prepare, and cultivate the soil before you plant. There are so many obstacles to growth in small business, and most for which we are unaware. 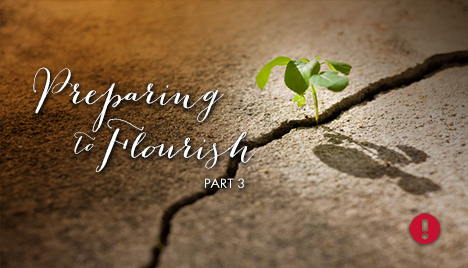 We must remove the rocks, pull the weeds, and mend the fences to flourish. We will point out some of these obstacles in the next few weeks of this series. In our experience of helping small business, it is always the same stupid rocks that keep tripping us up. 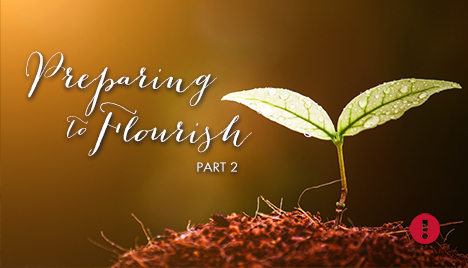 The more rocks we can help you pull out of your field, the more you will have the opportunity to flourish. We want to help you remove as many hindrances to growth as possible. The number one rock for any entrepreneur is Fear.Fear has kept many a good entrepreneur down. Fear can paralyze, and throw a wet blanket over every plan. Yet fear is normal. The more we try to avoid it, or deny its presence, the more it obstructs. The more we face it head on, the better we are able to overcome it. Remember the first time you applied for a job? Or the first time you drove a car? You were afraid, right? The reason you kept pushing through, despite the fear, was because there was this desire for something bigger and better just on the other side of that fear. And so you did it! Growing as an entrepreneur is the same. Small business often puts you in positions that you never imagine you would ever be, where your skills can grow and blossom. Courage and desire push forward, all because of the prize. Fear is a good indicator that we are growing. I have a friend who is beautiful, gifted, patient, and passionate about helping elderly people gain physical strength. No spandex here. She starts where they are, and works with what muscles they have. It was not long after she started her business that she recognized the need to hone her skill at giving presentations. She needed more confidence. So she decided to join Toastmasters. Surveys have shown that most people would rather go to a funeral than speak in front of a group. Still others would rather die. Yet the ability to communicate is a necessary skill of entrepreneurship. It is not optional. Gaining your own voice is scary. Upon facing her first speech assignment, she wanted to quit. After that, there were several more times she entertained the idea of quitting. She would say things like, “I sound like a robot when I listen to myself”. And “I just want to run away”. It was my privilege to encourage her. She later understood that fear was not an indicator that she was on the wrong path. Fear meant she was on the right one!Rather than being an indicator that she should quit, the fear gave evidence to the great importance she placed upon skillful communication. Her fear was the litmus of growth and courage. Every entrepreneur faces fear. Fear is the biggest rock in any field where you are trying to grow stuff. Instead of trying to plow around it, or deny fear, be honest with yourself. Acknowledge the fear is there. Instead of fearing failure, give yourself permission to fail. Give yourself permission not only to fail, but to flail around a bit–perhaps even to fall down before you accomplish anything at all. Failure is the prerequisite to success. Fear does not indicate what we do not want. It is an indicator of what we want. Instead of fearing the future, which all entrepreneurs will do, remind yourself that it is rare for things to turn out exactly as planned. Small business is not easy. Give yourself a break. Growing involves growing pains. If you are not growing, you are dying. Fear is part of growth. Even a small degree of change in your attitude about fear can make a monumental difference in your courage and confidence down the road. Even though farming is a crap shoot, farmers still plant. So go ahead. Plan and make your preparations. Cultivate your soil and plant your seeds. Acknowledge the rocks. Plan and plant for growth in your business, and expect the best. Then pray for rain. I have heard it said that faith prays for rain and then carries an umbrella. Got one? The planting season in Iowa is nearly in full swing. I live and work in the breadbasket State, and I am convinced that Iowa soil can grow just about anything. I have never tried it, but I am pretty sure I could stick a tin can in the ground, and something would come up. Iowa is a beautiful agrarian State. Think Grant Wood. Think rolling fields of rich brown earth dotted with shoots of chartreuse green, all reaching up to catch the first splinters of the morning sun. Picturesque, yes. But though I enjoy the beauty, I am glad that I am not a farmer. Why? Because farming is a crap shoot. You only get about 40-50 rolls of the dice to get it right. And even if you do your very best, the odds are stacked against you. There are perils–hail, floods, and good ole’ Iowa tornados– that can wipe out all your hard work in a manner of minutes, right before your very eyes. Small business is a lot like farming. With half of all start-ups failing in the first five years, and half of those that remain failing in the next five years, we are left with only 25% of the original number. That means even if you do your very best, the odds are stacked against you. There are many obstacles to hinder, handicap, and paralyze your progress, both inside and outside your business. I am in graphic design. I spend many hours helping my clients with the art of business, helping them to visually express their hopes and dreams. We pour ourselves into our work and with it, invest in their success. Whenever you make any kind of investment like this, you care about the return. We are grieved to see any one of them meet their demise. That is why all this month we are going to talk about growth, and more specifically, hindrances to growth. We will talk about a few big rocks in your own field that you may not have noticed in before. If we can dislodge even a few of them, we will have accomplished our goal. Imagine a farmer waiting until April to decide what she is going to plant. Imagine wasting the winter, leaving the equipment in the barn unserviced, unsharpened, and unprepared for the next planting season. Imagine a tiller of soil not caring to prepare the soil before planting. Imagine leaving the soil untested, or neglecting to work in the nutrients to ensure the harvest will be plentiful. Imagine not spending the time to choose the best seeds. Imagine missing the optimum planting window, because you were unprepared. Imagine planting the seeds haphazardly, in glops, here and there across the field. You would think the farmer less than serious. Unfortunately, it is not uncommon for us to meet entrepreneurs who work their business in the same way. They have nothing down on paper. They plan on the fly. They market haphazardly. They are unprepared for opportunity. They perceive daily planning as unnecessary. Somehow, despite the odds against them, they think they will succeed without it. It should come as no surprise that their equipment breaks down, that they do not get the crops they had hoped for, or that they spend all their time fighting off pests and varmints! No matter what business you are in, planning and cultivating come before planting.Becoming an entrepreneur, like farming, is a huge risk. But if you want to take your work seriously, you can mitigate much of the risk ahead of you. Sure, growth happens all by itself in Iowa. But left to itself, and Iowa would be covered with weeds. You cannot defy the laws of nature. You cannot cut any one step of planting and think that somehow you will harvest a bumper crop. In business, as in farming, we will reap what we sow, according to how we sow it. Bumper crops of sellable anything will never be achieved without planning, preparation, and cultivation. Plan to plan. It will help you cultivate your own growth, and create a business around your goals and dreams, instead of settling for whatever grows up through the weeds. What are you going to plant today? Need help with the Art of Business? Etc! Graphics, Inc has been doing business by design since 1988. Give us a call. Long before humans learned to write, they communicated. With The Big Idea in mind, our ancestors used hand prints and charcoal sticks to draw images on rock walls to tell future generations of conquests of the hunt, of collaboration with neighboring tribes, and details of common everyday life. They told us stories without words. I like to imagine that when they completed their creations, that Caveman and Cavewoman would stand back, admire their work and think to themselves, “There, that should be clear enough.” They expected everyone to get it. It was not long after that, Miss Communication was born, and humans have been in trouble ever since. George Bernard Shaw said that the biggest problem in communication is the illusion that it has taken place. Communication, as it turns out, is a lot harder than it looks, even if we draw pictures. The problem lies in the fact that no matter what story we tell, it only makes perfect sense to us. Clear communication is the primary work of graphic design. We are visual storytellers. We are interpreters. We are visual chemists. We are educators. We are visual philosophers because we think deeply about the meaning of every mark, shape, and color; meaning held within a context, in society, in culture, in history, and to an individual. Because words are limited in scope, we use fundamental visual building blocks to create perceptions and provide understanding. Verbal communication is hazardous. Visual communication even more. 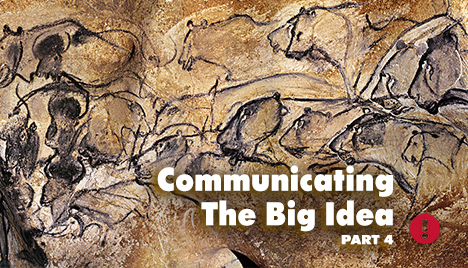 So how are we to communicate The Big Idea? Part of visual communication is knowing what story should be told. Part of communication is knowing who to tell. Part of it is the delivery, and where that delivery takes place. Part is the reception and perception. Add to this the many things that convey meaning, including color, shape, style, position, symbols, patterns, and most importantly, context. Even if all these things work well together, you cannot disregard the obstacles. The viewer could be distracted, bored, or bombarded, or just plain tired. What you have, then, is a fine kettle of fish. Getting The Big Idea message out is the primary work of business. Determining the method to use to do this work is part collaborative mess making, part curiosity, and part transformation. It becomes highly important when we consider all that is at stake. It is our privilege as graphic designers to help our clients find the gold in their business and to help them express The Big Idea. By solving these visual problems, we can affect the future of the company. No, we do not create magic. We provide a service. Future success is a collaborative effort. But no matter what, graphic design is a revealer. It is possible for us to create a design that makes visual promises, such as capacity or capability, only to have that same company fail to deliver on those promises. It is also possible for us to create a design that communicates and informs and allows entrepreneurs to enjoy the the return on their investment. The Big Idea is an investment. The thinking part is hard work, and graphic designers can only affect the externals. But when a company is prepared to communicate and deliver, good graphic design will water The Big Idea and help it to grow. The better designers and entrepreneurs can collaborate to tell the story of The Big Idea, the more likely it is that the audience will want to be a part of that story. But imagine the obstacles and complications to communication when it is not clear what story should be told? When the story has not been considered, developed, or clarified? When the characters and the plot and the goal have not been determined? When no one is sure why the story even matters in the first place? To convey The Big Idea, you must have one. Poor visual design is litmus that the underlying story lacks clarity. Good design can carry a company for a while, but it cannot carry a company that lacks a clear identity for long. How is your story coming? Is your story clear? Is your graphic design conveying the right perceptions? Honest design is always the best design. Clarify your own Big Idea. Think about it. Mull over it. Devote your best self to it. It will help you to find the gold in your business. Better than that, you will find the gold has been there all along, just waiting for you to pan for it. What is The Big Idea? Part 1 here. What’s the Big Idea? Finding Your Sweet Spot, Part 2 here. The Big Idea- The Gravity of Purpose Part 3 here. Need help for your business? Etc! Graphics, Inc has been doing business by design since 1988. Give us a call.